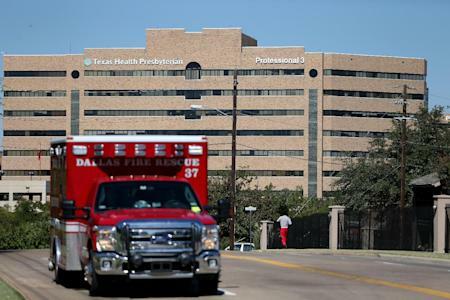 DALLAS — The first person to be diagnosed with Ebola in the United States died early Wednesday, officials with Texas Health Presbyterian Hospital announced. Thomas "Eric" Duncan, 42, passed away at 7:51 a.m., the hospital said. Duncan, a Liberian citizen who recently traveled from West Africa to Dallas, had been in isolation at Texas Health Presbyterian for 10 days. He had come to Texas to reunite with an estranged son and the teen's mother, Louise Troh, who had been his girlfriend when she lived in Liberia. Troh is being kept in quarantine because she had contact with Duncan, but released a statement following his death. “His suffering is over," Troh said. “My family is in deep sadness and grief, but we leave him in the hands of God. Our deepest sympathies go out to his father and family in Liberia and here in America. Eric was a wonderful man who showed compassion toward all." The state health department said it will follow recently issued CDC guidelines for handling Duncan's body, which could remain contagious for several days. The health department said Duncan's family agreed with their request to cremate him. Duncan’s death comes four days after his condition was downgraded from serious to critical. Over the weekend, he had begun receiving brincidofovir, an experimental antiviral drug that recently gained emergency approval from the Food and Drug Administration. There is no known cure treatment for the Ebola virus, which spreads through direct contact with bodily fluids and is fatal in 60 to 90 percent of all cases. Troh and three of her family members have been in quarantine for more than a week because they were living in the same apartment with him. On Tuesday, Duncan's son, Karsiah, travelled from West Texas to try and see his father for the first time in 16 years. Duncan is the first person known to die of Ebola in the United States. The virus has killed more than 3,400 people in West Africa in 2014, the World Health Organization estimates. CDC director Dr. Tom Frieden said Duncan's death is a reminder of the “deadly enemy" ravaging West Africa. “(Duncan) is the face that we associate now with Ebola," Frieden said. Five Americans who were diagnosed with Ebola in Africa have returned to the United States for treatment since late July. Aid workers Kent Brantly, Nancy Writebol and Rick Sacra made full recoveries. WHO said one of its doctors was transported to Emory University Hospital in Atlanta on Sept. 9. No other details have been released. Ashoka Mukpo, a cameraman working for NBC News, arrived at the Nebraska Medical Center in Omaha for treatment on Monday. Duncan’s illness and treatment sparked controversy. He arrived in Dallas on Sept. 20 from Liberia, one of the areas hit hardest by the outbreak. His neighbors in Monrovia told reporters that five days before his flight, Duncan helped a pregnant woman get to the hospital in a taxi. She was convulsing and vomiting. The woman died at home hours later, after being turned away from a crowded Ebola treatment ward. It is unclear if Duncan knew the woman had Ebola, but Liberian government officials said they planned to prosecute him for lying on health forms he completed at the airport on Sept. 19. Duncan answered “no” to questions about whether he had cared for an Ebola patient or touched the body of someone who had died in an area affected by Ebola. CDC officials said Duncan didn’t have a fever or symptoms of Ebola when he boarded his flight in Liberia, which made multiple stops. He also had a three-hour layover in Washington, D.C., before arriving in Texas. Five days after getting to Dallas, Troh drove Duncan to the emergency room at Texas Health Presbyterian. Hospital officials said he showed up in the middle of the night with a fever of 100.1 degrees, abdominal pain for two days, a sharp headache and decreased urination. The hospital said Duncan told them he had not experienced nausea, vomiting or diarrhea — strong indicators of Ebola. Federal guidelines published in August state that someone in Duncan’s condition and who was known to have been in West Africa should be placed in isolation and tested for Ebola. Instead, Duncan was given a prescription for antibiotics and sent home. Hospital officials initially blamed a flawed records system for the mix-up but have since retracted that explanation. No other explanation has been given for how the Ebola diagnosis was overlooked. In her statement on Wednesday, Troh thanked several members of the Dallas civic and faith community for their support, but did not mention the hospital. “I trust a thorough examination will take place regarding all aspects of his care,” Troh said. Duncan’s condition had worsened by the time he was brought back to Texas Health Presbyterian two days after being discharged. He was reportedly vomiting as paramedics put him in the ambulance at the apartment complex where he had been living with family and friends. Those paramedics are among seven health care workers who are now being monitored for Ebola symptoms. Three people from the apartment, including Troh, are also considered to be at high risk, since they had direct contact with Duncan. An additional 38 individuals, including a man who was treated in the same ambulance after it had been used to transport Duncan, are considered low-risk contacts but will be monitored for 21 days, the maximum period it may take for symptoms to appear. No one being monitored has shown signs of the illness thus far, officials said. Texas Health Presbyterian immediately isolated Duncan upon his second arrival at the hospital. According to the Dallas Morning News, the hospital may have violated federal guidelines by delaying a blood test for Ebola. According to the report, other testing and blood work was done first to rule out other causes. The Ebola test was not performed and confirmed until two days after Duncan was placed in isolation. The CDC's Frieden called the mishandling a "teachable moment" and issued a nationwide alert to all hospitals updating them on how to appropriately respond to possible Ebola cases. On Wednesday, Dr. Lakey, the state health commissioner, acknowledged the hospital's efforts to treat Duncan. Jason Sickles is a reporter for Yahoo. Have a story tip? Email him at jsickles@yahoo-inc.com. Follow him on Twitter (@jasonsickles).